Typical illustration of the Sacred Heart of Jesus Christ. 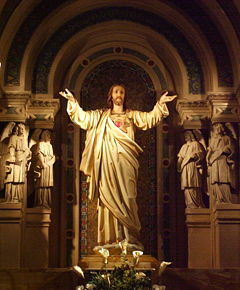 The Sacred Heart is a devotional representation of Jesus' physical heart that symbolizes his divine love for humanity. Depicted in Christian art as a heart shining with divine light, surrounded by a crown of thorns, pierced by a lance-wound and bleeding, the Sacred Heart alludes to the manner of Jesus' death by crucifixion. The light surrounding the heart represents the fire of love that constitutes Jesus' essence, and to which he points for guidance. Predecessors to the modern devotion to the Sacred Heart existed to some extent since the Middle Ages in various mystical sects. Its modern form is derived from a French Catholic nun Marguerite Marie Alacoque, who said she learned the devotion from Jesus in visions. Devotion towards the Sacred Heart is predominantly found in the Roman Catholic and Anglican churches. Additionally, the Sacred Heart may sometimes be seen in the Eastern Catholic Churches, where, however, it remains a point of controversy as an example of liturgical latinization. The Feast of the Sacred Heart is a holy day in the Roman Catholic liturgical calendar, and is celebrated 19 days after Pentecost. Sacred Heart is still a widely used name for many Roman Catholic institutions, including schools, colleges, and hospitals in many countries around the world. It is also the name of many Roman Catholic parishes, religious orders, and stores selling Roman Catholic goods. During the first ten centuries of Christianity, there is nothing to indicate that any worship was rendered to the wounded Heart of Jesus. The first indications of devotion to the Sacred Heart are found in the eleventh and twelfth centuries in the fervent atmosphere of the Benedictine and Cistercian monasteries. Some of the other precursors were St. Gertrude, St. Mechtilde, and the author of the "Vitis mystica" (previously ascribed to St. Bernard, now attributed to St. Bonaventure). From the thirteenth to the sixteenth centuries, the devotion spread to different religious congregations, such as the Franciscans, Dominicans, Carthusians, etc. It was, nevertheless, a private, individual devotion of a mystical type. Nothing of a general movement had been inaugurated, except for similarities found in the devotion to the Five Wounds by the Franciscans, in which the wound in Jesus' Heart figured most prominently. In the sixteenth century, the devotion passed from the domain of mysticism into that of Christian asceticism. Prayers and special exercises to the Sacred Heart are found in the writings of Lanspergius (d. 1539) of the Carthusians of Cologne, the Louis of Blois (Blosius; 1566), a Benedictine and Abbot of Liessies in Hainaut, John of Avila (d. 1569) and St. Francis de Sales, the latter belonging to the seventeenth century. The historical record from that time shows a blossoming of the devotion. Ascetic writers spoke of it, especially those of the Society of Jesus, which commonly placed the image on the title-pages of their books and the walls of their churches. Nevertheless, the devotion remained an individual, or at least a private, devotion. Jean Eudes (1602-1680 C.E.) made it public, gave it an Office, and established a feast for it. Père Eudes was the apostle of the "Heart of Mary"; but in his devotion to the Immaculate Heart there was a share for the Heart of Jesus. Little by little, the devotion to the Sacred Heart became a separate one, and on August 31, 1670, the first feast of the Sacred Heart was celebrated in the Grand Seminary of Rennes. Coutances followed suit on October 20, a day with which the Eudist feast was from then on to be connected. The feast soon spread to other dioceses, and the devotion was likewise adopted in various religious communities. It gradually came into contact with the devotion begun at Paray, and resulting in a fusion of the two. The Sacred Heart Sculpture on the High Altar of the Cathedral Church of Saint Patrick in El Paso, TX. "On December 27, probably 1673, the feast of St. John, Margaret Mary reported that Jesus permitted her, as He had formerly allowed St. Gertrude, to rest her head upon His Heart, and then disclosed to her the wonders of His love, telling her that He desired to make them known to all mankind and to diffuse the treasures of His goodness, and that He had chosen her for this work. In 1674, Margaret Mary claimed that Jesus requested to be honored under the figure of His Heart of flesh, also claiming that, when He appeared radiant with love, He asked for a devotion of expiatory love: frequent reception of Communion, especially Communion on the First Friday of the month, and the observance of the Holy Hour. "During the octave of Corpus Christi, 1675, probably on June 16, the vision known as the "great apparition" reportedly took place, where Jesus said, "Behold the Heart that has so loved men … instead of gratitude I receive from the greater part (of [hu]mankind) only ingratitude …," and asked Margaret Mary for a feast of reparation of the Friday after the octave of Corpus Christi, bidding her consult Father de la Colombière, then superior of the small Jesuit house at Paray le Monial. Solemn homage was asked on the part of the king, and the mission of propagating the new devotion was especially confided to the religious of the Visitation and to the priests of the Society of Jesus." A few days after the "great apparition," Margaret Mary reported everything she saw to Father de la Colombière, and he, acknowledging the vision as an action of the Spirit of God, consecrated himself to the Sacred Heart and directed her to write an account of the apparition. He also made use of every available opportunity to circulate this account, discreetly, through France and England. Upon his death on February 15, 1682, there was found in his journal of spiritual retreats a copy in his own handwriting of the account that he had requested of Margaret Mary, together with a few reflections on the usefulness of the devotion. This journal, including the account and an "offering" to the Sacred Heart, in which the devotion was well explained, was published at Lyons in 1684. The little book was widely read, especially at Paray. Margaret Mary reported feeling "dreadful confusion" over the book's contents, but resolved to make the best of it, approving of the book for the spreading of her cherished devotion. Outside of the Visitandines, priests, religious, and laymen espoused the devotion, particularly the Capuchins, Margaret Mary's two brothers, and some Jesuits, among the latter being Fathers Croiset and Gallifet, who promoted the devotion. The death of Margaret Mary, October 17, 1690, did not dampen the zeal of those interested; on the contrary, a short account of her life published by Father Croiset in 1691, as an appendix to his book "De la Dévotion au Sacré Cœur," served only to increase it. In spite of all sorts of obstacles, and of the slowness of the Holy See, which in 1693 imparted indulgences to the Confraternities of the Sacred Heart and, in 1697, granted the feast to the Visitandines with the Mass of the Five Wounds, but refused a feast common to all, with special Mass and Office. The devotion spread, particularly in religious communities. The Marseilles plague, 1720, furnished perhaps the first occasion for a solemn consecration and public worship outside of religious communities. Other cities of the South followed the example of Marseilles, and thus the devotion became a popular one. In 1726 it was deemed advisable once more to importune Rome for a feast with a Mass and Office of its own, but, in 1729, Rome again refused. However, in 1765, it finally yielded and that same year, at the request of the queen, the feast was received quasi-officially by the episcopate of France. On all sides it was asked for and obtained, and finally, in 1856, at the urgent entreaties of the French bishops, Pope Pius IX extended the feast to the Roman Catholic Church under the rite of double major. In 1889, it was raised by the Roman Catholic Church to the double rite of first class. The Roman Catholic acts of consecration, reparation and devotion were introduced when the feast of the Sacred Heart was declared. In his Papal Bull Auctorem Fidei, Pope Pius VI praised devotion to the Sacred Heart. Finally, by order of Leo XIII, in his encyclical Annum Sacrum (May 25, 1899), as well as on June 11, he consecrated every human to the Sacred Heart. The idea of this act, which Leo XIII called "the great act" of his pontificate, had been proposed to him by a religious woman of the Good Shepherd from Oporto (Portugal) who said that she had supernaturally received it from Jesus. Depiction of the Sacred Heart in a convent chapel. The Enthronement of the Sacred Heart is a Roman Catholic ceremony in which a priest or head of a household consecrates the members of the household to the Sacred Heart. A blessed image of the Sacred Heart, either a statue or a picture, is then "enthroned" in the home to serve as a constant reminder to those who dwell in the house of their consecration to the Sacred Heart. The practice of the Enthronement is based upon Pope Pius XII's declaration that devotion to the Sacred of Jesus is "the foundation on which to build the kingdom of God in the hearts of individuals, families, and nations..."
Since c. 1850, groups, congregations, and States have consecrated themselves to the Sacred Heart. In 1873, by petition of president Gabriel García Moreno, Ecuador was the first country in the world to be consecrated to the Sacred Heart, fulfilling God's petition to Saint Margaret Mary over two hundred years later. Peter Coudrin of France founded the Congregation of the Sacred Hearts of Jesus and Mary on December 24, 1800. A religious order of the Roman Catholic Church, the order is best known for its missionary work in Hawaii. Mother Clelia Merloni from Forlì (Italy) founded the Congregation of the Apostles of the Sacred Heart of Jesus in Viareggio, Italy, May 30, 1894. Religious imagery depicting the Sacred Heart is frequently featured in Roman Catholic, and sometimes Anglican homes. Sometimes images display beneath them a list of family members, indicating that the entire family is entrusted to the protection of Jesus in the Sacred Heart, from whom blessings on the home and the family members are sought. The prayer "O Sacred Heart of Jesus, I place all my trust in Thee" is often used. 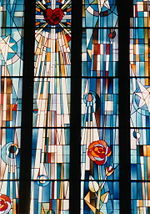 One particular image has been used as part of a set, along with an image of the Blessed Virgin Mary. In that image, Mary too was shown pointing to her "Immaculate Heart," expressing her love for the human race and for her Son, Jesus Christ. The mirror images reflect an eternal binding of the two hearts. Roman Catholics are encouraged to wear a small, postage-stamp sized paper portrait of the Sacred Heart, usually glued to red flannel, on a thin ribbon necklace with a similar amulet hanging at the back. This is known as a scapular. Many members of the Carlist military forces of the nineteenth and twentieth centuries in Spain wore detentes or amulets with an image of the Sacred Heart. These Roman Catholic monarchists believed the image would protect them against wounding by the enemy firearms. This motif has become a part of vernacular culture through its appropriation by tattoo artists. An image significantly similar to the Sacred Heart of Jesus, or the Immaculate Heart of His Mother Mary, was used as the logo for Baz Luhrman's movie Romeo + Juliet (1996). Heavy metal musician Ronnie James Dio, who was raised as a Roman Catholic, entitled his third studio album "Sacred Heart." In addition, the hospital featured on the television sitcom Scrubs is named "Sacred Heart Hospital." ↑ Devotion to the Sacred Heart may be found in some Eastern Catholic Churches, but is a contentious issue. Those who favour purity of rite are opposed to the devotion, while those who are in favour of the devotion cite it as a point of commonality with their Latin Catholic brethren. ↑ Since Pentecost is always celebrated on Sunday, the Feast of the Sacred Heart always falls on a Friday. ↑ Sacred Heart of Jesus: Margaret Mary Apparition'www.sacredheart-paray.com.Retrieved February 23, 2008. 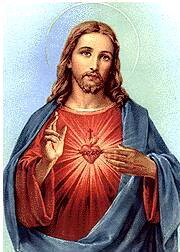 ↑ The Sacred Heart of Jesus: Symbol of Combativity and the Restoration of Christendom.www.freerepublic.com.Retrieved February 23, 2008. Devotion to the Sacred Heart of Jesus, from Catholic Encyclopedia. Devotion to the Sacred Heart of Jesus Sisters of Carmel. This page was last modified on 23 July 2015, at 16:46.